Dental implants are a popular dental procedure that can replace missing teeth and restore a full, healthy smile. While dental implants are a long-lasting tooth replacement option, they require adequate jawbone density and volume to be placed properly. In some cases, patients may not have sufficient jawbone density or volume to support dental implants. Fortunately, advancements such as dental bone grafting allow patients who were previously not candidates for dental implant surgery to receive dental implants following a bone graft to the desired area. New York oral surgeon Dr. Mark Stein offers jawbone grafting with (leukocyte platelet rich fibrin) L-PRF™ in NYC to promote proper healing and the most successful jawbone regeneration procedure possible. PRF stands for platelet rich fibrin and is completely autologous, which means that it is obtained and created using your own blood cells or tissues. In the case of PRF, often referred to as L-PRF™ or leukocyte platelet rich fibrin, your own blood is spun down to create the sample PRF. PRF therapy is an excellent tool to aid in bone grafting as it is durable, strong, able to be sutured, and is an ideal matrix for bone grafting material. When making L-PRF™, your blood is spun down to create a sample that has a high concentration of platelets. Typically, the platelets are concentrated 3-5 times more than that found in a whole blood sample. 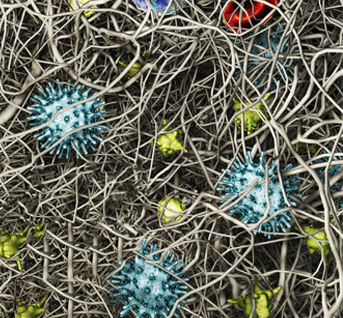 The natural functionality of platelets is to bind to damaged vessels in the body, such as a cut, and promote clotting and initiate the healing cycle. When PRF is used in the body, the platelets are initiated by the natural tissues in your body. This causes a series of growth factors to be released into the bone graft, which will greatly aid in the healing process. These growth factors often continue to be released for over a week while your body begins to heal the bone graft itself. When used in oral surgery, PRF works in a similar way to improve healing and the quality of the jawbone graft. How is a PRF sample made? Leukocyte platelet rich fibrin is created chairside during your appointment with Dr. Stein. When creating a PRF sample, Dr. Mark Stein uses the IntraSpin™ system by Intra-Lock®. The IntraSpin™ system is the only medical device that has been cleared by the FDA for the production of high quality L-PRF™ samples. To begin your PRF treatment, Dr. Stein will take a blood sample. This process is exactly like undergoing a routine blood test. After taking your blood samples, Dr. Mark Stein will place these vials of your blood in the IntraSpin™ centrifuge. Typically, the blood is spun in the machine for 12-18 minutes, but individual time may vary from patient to patient. 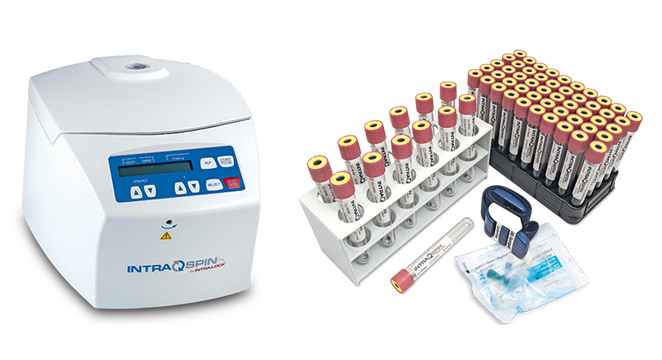 The IntraSpin™ centrifuge has been scientifically designed with specific features in order to ensure the highest quality platelet rich fibrin sample possible. As your blood samples are being spun down, they will separate into different segments and consistencies, forming a fibrin material known as PRF. At this point in your PRF treatment, the fibrin material will be retrieved from the vials, and any red blood cell material will be removed from the sample. Dr. Stein will then place the PRF samples on a device known as an Xpression™ Box, which is specifically designed to optimize the last steps of creating a high quality sample of PRF. The fibrin material will be placed on the perforated tray of the Xpression™ Box, and a compression tray will be placed over these samples. Additionally, a weighted cover will be placed over this tray for approximately 5 minutes. This pressure extracts serum from the samples and creates durable compressed fibrin membranes which are now ready to be used for a dental bone graft. At this point in your treatment, the PRF sample can be mixed with autograft material or dental bone grafting material prior to application. What is the difference between PRF and PRP? Similar to PRF, (platelet rich plasma) PRP also uses your own blood to create a sample that has been spun down to have a higher concentration of platelets. Instead of making a fibrous material like PRF, platelet rich plasma creates a liquid sample that is separated into red blood cells, white blood cells, and plasma. This plasma can then be used for a wide range of medical procedures. PRP is known for its remarkable ability to initiate and promote healing in the body and has been used in a variety of medical, cosmetic, and dental procedures for its extraordinary healing properties. Although PRP has many advantages, PRF is often used for jawbone grafting because of its durability and because it proves to be an ideal matrix for bone grafting material. When a patient has insufficient jawbone density or volume to place dental implants, a bone graft can be used to restore or regenerate bone density in the jaw. Bone tissue has the natural ability to regrow when damaged. Dental bone grafts allow Dr. Mark Stein to carefully place bone grafting material in areas of low jawbone density, promoting bone regeneration. Following the placement of a successful bone graft, the jawbone is typically able to properly support dental implants. The material used for a bone graft varies with each individual case. For some individuals, Dr. Stein may be able to use the patient's own bone from another part of the body as the bone graft material for the jaw. In other cases, bone grafting material may be obtained from a cadaver or created using synthetic materials. How can PRF be used for jawbone grafting? When an L-PRF™ sample is compressed on the tray of the Xpression™ Box, a serum accumulates at the bottom of the tray. This serum has a high number of growth factors and can be used as a hydrating substance for bone grafting material. Mixing the serum with bone grafting material causes the material to be more bioactive and makes the material easier to manipulate for our oral surgeon. 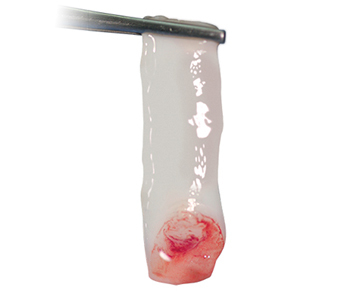 PRF can be incorporated with bone graft material by mixing leukocyte platelet rich fibrin with bone grafting material. Bone grafting material can also be placed within a layer of PRF. The bone grafting material will be enclosed within a shell of L-PRF™ and then used during a jawbone graft. Finally, the bone grafting material can also be mixed with PRF prior to the sample coagulating. In cases like this, following coagulation, it will create a thick sample of PRF that may be molded more easily. Dr. Mark Stein can help decide which method of jawbone grafting with PRF is best for your individual case. PRF contains a high number of growth factors that have been shown to promote rapid healing. The healing response of PRF is especially important during the first week after your jawbone grafting procedure. L-PRF™ stimulates bone growth and helps the bone graft to more successfully promote bone regeneration in areas of low volume. L-PRF™ has also been shown to expedite the initial healing process of the bone graft, ensuring the most successful bone graft treatment. How do I get started with platelet rich fibrin for dental bone grafting? Dr. Stein and his staff would be happy to discuss PRF for jawbone grafts with you. Please call 212-888-4760 or schedule an appointment online to arrange for a private consultation at our office.